As winter riding goes, this Saturday morning was really nice. A crisp 20 degrees with no wind. Perfect to ride to the YMCA for a racquetball match. 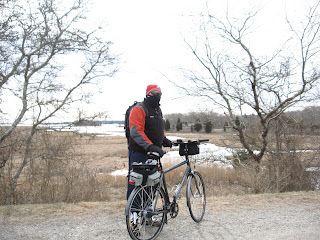 As is said on many bike forums and blogs, "it's all in the layers". I couldn't pass my favorite spot without a winter photo with the commuter. 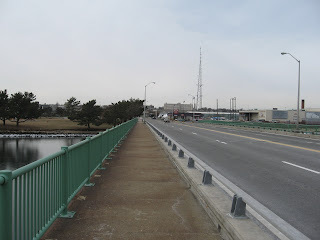 The bike path parallels the hurricane barrier as it approaches the center of town, before dropping the riders off at the waterfront. 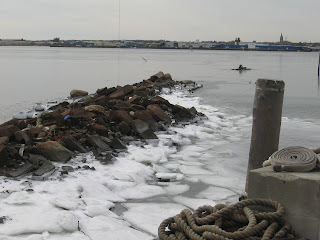 A cold icy waterfront. 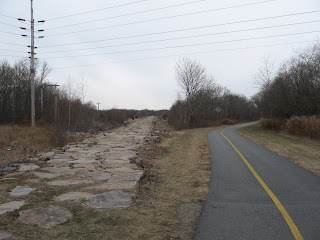 At the end of the path is the Island Ferry maintenance facility, with a couple of the big girls in for repair. 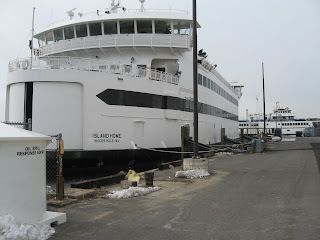 A quick ride north is the approach to the bride that crosses the harbor into New Bedford Ma. 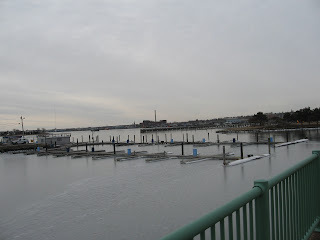 To the south of the bridge approach the lonely boat docks sit waiting for the warmer days and the return of their craft. (and the robins). At the far end of the bride there are stairs leading to the road below. 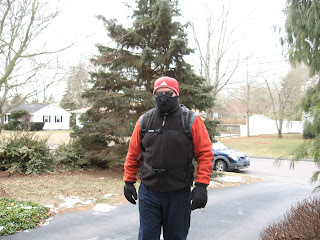 A quick ride after portaging the stairs and I was at the Y, ready to take on all comers. A really good, competitive hour of racquetball three or four times a week, almost makes up for not bike commuting. Almost. 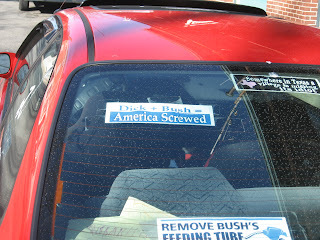 I saw this car whose owner wears their politics on their sleeve. Except for a couple of stubborn pockets around the country, this seems to be the opinion of Americans. The party is over for the GOP I suppose. I only hope it isn't too late. I'm hoping the cold stuff passes soon. It'd be cool to have a zero-drive commute month come April or May. Man, that looks cold. Kudos to you for riding.